The Center for Medical Progress (CMP) has released 10 undercover videos secretly shot in and around Planned Parenthood facilities. The videos seek to prove that America’s largest abortion provider was impermissibly modifying abortion procedures to help harvest fetal organs from babies who were still alive, and whose mothers who were not told how their child’s remains would be used in macabre medical experiments. One of those 10 videos also included some abortion footage which was provided by our Center for Bio-Ethical Reform (CBR), which I direct. That video can be seen at our AbortionNO.org website. 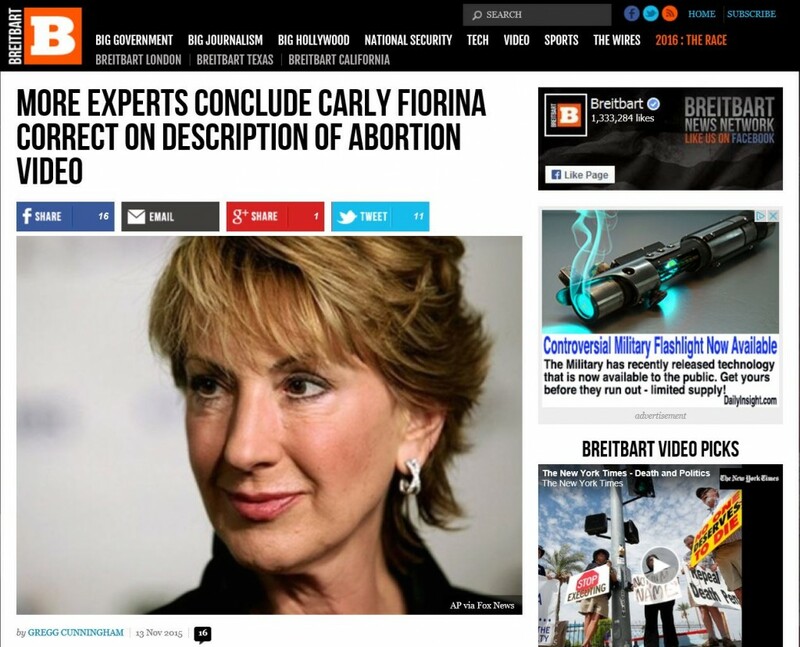 Presidential candidate Carly Fiorina sharply criticized Planned Parenthood’s organ sales business during the CNN Republican primary debate on September 16, 2015, and she cited our video in her statement. She said the video showed a “fully formed fetus on the table, its heart beating, its legs kicking, while someone says ‘We have to keep it alive to harvest its brain.’” If you want to see the image, click here. She was immediately and predictably attacked by medical “experts” who accused her — and by implication, us — of fraud. The fraud, they claimed, was that our video of a deliberate, late-term abortion was really from a tragic and innocent miscarriage. These claims of fraud became so bizarre that critics even claimed Planned Parenthood was not doing what it has bragged about doing (Planned Parenthood President “Cecile Richards ‘Proud’ of … Organ Harvest …,” September 28, 2015, Breitbart.com). After the furious, media-magnified criticism of Ms. Fiorina’s references, we consulted a new panel of medical and legal experts whose opinions, in the aggregate, support our statement — and Ms. Fiorina’s statement — that our video shows an abortion, not a miscarriage. As will be established below, Ms. Fiorina is right on the facts, right on the law, and right on the issues of human decency. We could convincingly settle the matter if CBR could explain where and how we got the video. But we cannot do so. We are prohibited by confidentiality agreements from disclosing dispositive facts. Fair-minded readers, however, are likely to find the indirect evidence more than adequate. What follows is a point-by-point refutation of the questionable and patently false claims advanced by Ms. Fiorina’s critics. We recognize that the first segment of the video, the direct evidence of abortion versus miscarriage, up to the point of the baby’s expulsion, is inconclusive. From expulsion on, however, the circumstantial evidence overwhelmingly supports our knowledge that this is a vide of an abortion. The eleventh Planned Parenthood undercover video has just been released by CMP. It shows an abortionist named Dermish describing using ultrasound to reorient head-down fetuses so they can be brought through the birth canal in a breech position. This modification of a common abortion procedure permits wider dilation of the cervix, which is the opening of the uterus. The baby’s head is thereby less likely to be crushed, and its brain will be preserved for harvesting. The fact that these organ donor babies are therefore being kept alive longer is incontestable. Yet Ms. Fiorina’s descriptions of these processes continues to be disputed, along with her implied contention that the video in question depicts an abortion and not a miscarriage. The U.K.’s Guardian newspaper said that “whether what the 13-minute video shows is an abortion is still fiercely contested.” So “fiercely,” in fact, that some of the “experts” are even debating themselves. Dr. Jennifer Gunter told The Guardian “it’s a premature delivery, a miscarriage …” But on September 29, Slate’s Amanda Marcotte interviewed her and reported that “… Gunter couldn’t rule out abortion ….” Which is it? An unnamed abortion provider “in the Midwest” admitted to The Guardian that he couldn’t be 100% sure the video did not show an abortion. But then, like Dr. Gunter, he also contradicted himself and decided it was in fact a miscarriage. “This is a cynical and callous exploitation of a patient’s personal tragedy in suffering this miscarriage … and in such a way as to mislead for political gain,” he claimed. The Guardian quotes “another medical expert” who admitted that he/she also “could not say 100% …,” nor, in fact, could any of The Guardian’s experts. And the British paper was not alone in reporting unanimous “expert” uncertainty. 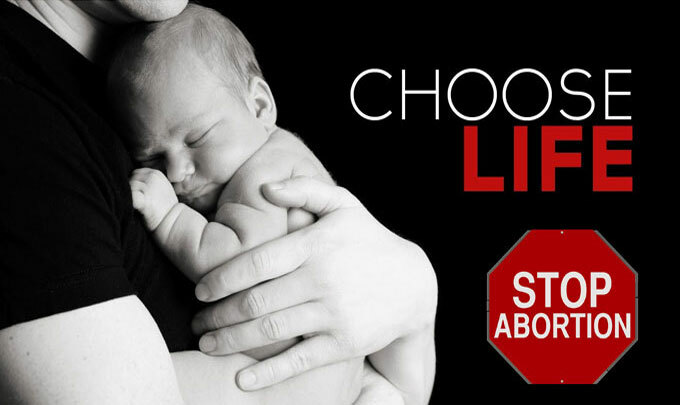 Jeffery Perlman, a neonatologist at Weill Cornell Medical College told TIME magazine (September 29, 2015) that “it could be an abortion ….” This inability to offer a dispositive conclusion (can you make this simpler?) was echoed by the medical experts contacted by our Center for Bio-Ethical Reform (CBR). As we noted earlier, in the first segment of the video, the direct evidence of abortion versus miscarriage, up to the point of the baby’s expulsion, is inconclusive. But from expulsion on, however, the circumstantial evidence overwhelmingly supports our knowledge that this is a video of an abortion. As OB/GYN Emilie Stickley notes, the disputed video, up to the point of the baby’s intact delivery, is inconclusive because an induced “abortion of a fetus of this stage of gestation would be indistinguishable” from a video depicting a miscarriage. But a real abortion expert, however, Dr. Deborah Nucatola, says there is no such thing as a “typical” abortion technique. Dr. Nucatola is Planned Parenthood Senior Director of Medical Services, and she told undercover investigators from the Center for Medical Progress (CMP) that “every clinic I’ve been to has an entirely different protocol as ‘these are all the things you must do,’ and it allows for incredible variability.” She adds that abortion techniques are “really all over the map.” She illustrates this procedural diversity by noting that “we have affiliates that use digoxin or some other feticide,” and affiliates which use none at all. But the Guttmacher Institute reports that 35% of abortion providers are hospitals and that 4% of terminations are performed there. In some years, that would amount to 50,000 abortions. That is not a “few,” and a substantial percentage of hospital abortions are later-term, as is the termination recorded in the Fiorina video. In South Carolina, for example, late-term abortions are performed in hospitals because no state-certified abortion clinics end pregnancies after sixteen weeks. Wrong again. Warren Hern, a late-term abortionist who wrote the book Abortion Practice, reveals that he uses receiving blankets (“Abortion Bill Skips the Fine Print,” The New York Times, May 24, 1997) to heighten the illusion that babies he has just killed died of natural causes. “After the abortion, my staff and I wrapped the fetus in a baby blanket and presented it to the couple. It was now their stillborn baby.” It was only “stillborn” because he killed it before birth. Hern has arguably had a greater clinical influence on abortion providers than any other practitioner. Planned Parenthood’s Dr. Deborah Nucatola told CMP investigators “I love Warren Hern … I use his instruments. I use a lot of his techniques ….” So did another prominent late-term abortionist who was also a prolific user of receiving blankets. A National Review article (by this author), “Cyberculture of Death,” November 10, 1997, describes a promotional video in which the late George Tiller “offers patients an opportunity to obtain a family photo … holding their dead baby,” assumedly wrapped in a blanket. The same Guardian experts argue that our abortion video contains “no recorded action by medical staff to accelerate” the expulsion of the placenta, which they contend is done during abortions, but not in miscarriages. But that is also incorrect. The audio track, which CBR was required to remove by the terms of our confidentiality agreement, does, in fact, record the abortionist taking action to accelerate the placenta’s expulsion. But none of these news organizations mentions that she also recently wrote a blog post under the categories “Abortion, War on Women,” and “Wielding the Lasso of Truth.” It is titled “What is the ‘Mexican Abortion Pill’ and How Safe Is It?” Her essay is little more than a “bloody coat hanger” screed against the Texas legislature’s measures to regulate abortion clinics. But more problematic than Dr. Gunter’s gaffes and bias are the stumbles of TIME’s experts. One critical factor that supports our claim about the video is that the abortion participants make no effort to revive the child — which they would certainly do if the video showed a miscarriage. Two of these doctors, however, admit that they never saw the disputed video. So how could they know whether the baby (if it was a miscarried, wanted baby) was not old enough to warrant at least such simple, non-invasive intervention as mask resuscitation? A 2011 post at TIME.com by Bonnie Rochman (“A 21-Week-Old Baby Survives …”) says “even early ultrasounds that predict a due date are essentially guesstimates” and that “it’s tough to definitively date a preterm birth.” The Royal College of Obstetricians and Gynaecologists published a paper in 2014 (“Perinatal Management of Pregnant Women at the Threshold of Infant Viability (The Obstetric Perspective)”), which confirms the difficulty in accurately determining a preemie’s age as an indicator of eligibility for resuscitation. The paper cites a systematic review in which “large random errors were reported ….” The authors recommend that “a decision to resuscitate a baby born at extreme prematurity should not be based solely on EFW [estimated fetal weight] but on consideration of the true birthweight measured immediately after birth, and neonatal vigor.” There is no sign, however, that the attending physician in the Fiorina video made any attempt to ascertain the baby’s actual weight. The TIME.com post, however, quotes a neonatologist who says of resuscitation, “If parents insist on treatment and the baby weighs more than 500 grams (about 17.5 ounces), ‘most of us give it a try’ …” Yet the doctor in the disputed video fails to weigh this baby, despite the fact that it meets the “signs of life at birth” standard described in a 2003 British Medical Journal article titled “Non-Viable Delivery at 20-23 Weeks Gestation: Observations and Signs of Life After Birth.” Our own experts differed widely in estimating the baby’s age, with speculation ranging from fifteen weeks all the way to twenty. Women go to hospitals, not abortion clinics, to sustain a pregnancy at risk of spontaneous loss. Dr. Mary Davenport explains that prior to 4 cm to 5 cm dilation, a hospital “could try a rescue cervical cerclage to sew the cervix shut” and “use medications to stop or slow labor.” The disputed video shows no evidence that the attending physician made any attempt to save the pregnancy. Reasonable minds might disagree on the issues of fetal age and resuscitation, but not on the question of comfort care for preemies. None of the experts quoted by any of the news organizations which covered this controversy even mentioned palliative care for this child, who was manifestly alive at delivery. The image is here. If the video showed a miscarriage, the staff would have given the child at least palliative care. No excuses are given by our critics for the lack of palliative care. That is shockingly incorrect from both a clinical and a liability perspective. There are two relevant standards of care in cases of miscarriage. The first is resuscitative care — a doctor makes an expert judgement whether the baby can benefit from attempts to resuscitative, usually, by weighting the baby and seeing if they can breath with the help of an oxygen mask. If the baby is assessed as being too premature to revive, the second standard of care kicks in — providing palliative care, or comfort care. No-one in the video tries to provide resuscitative or palliative care. WebMD’s Palliative Care Center stresses the importance of “addressing any pain or discomfort the newborn may experience” when resuscitation is likely to produce more burden than benefit for previable preemies. Were the baby in the disputed video a miscarried, wanted baby, the requisite standard of care would have been at least comfort-care. Warming. A blanket. Holding. This baby, however, is not only neglected, it is abused — dropped in a cold steel pan, jerked, smacked, and prodded with surgical instruments. This is the sort of post-delivery circumstantial evidence which shows the purpose is abortion. Professor Byron Calhoun said “we do not treat our babies this way.” He added that if the baby were a born alive, wanted, miscarried child, “we would wrap them in a blanket and offer mom a chance to hold her baby and treat them with respect.” The image is here. Neither would most juries. If the abuse captured in the video on which Carly Fiorina commented were committed by an OB/GYN against a wanted, miscarried baby, a medical malpractice plaintiff’s lawyer could have a field day with it. The OB/GYN’s liability insurer would quickly settle any claim for failing to provide the required standard of care, which in this case would at least be palliative care. The doctor’s abuse of this baby is legally inconsequential if this is an abortion, but it risks a ruinous, runaway verdict if this video records a miscarriage and were ever seen by a jury. We contacted an experienced medical malpractice defense attorney and he referred us to links which confirmed that virtually no OB/GYN would allow a video camera in the room where the doctor is managing a high-risk crisis likely to result in a late-term pregnancy loss – and none in their right mind would abuse a wanted baby in front of a camera. The legal peril posed by video cameras is arguably highest for OB/GYNs. The New England Journal of Medicine published a study titled “Malpractice Risk According to Physician Specialty (August 18, 2011) which reported that OB/GYNs get hit with the “most [malpractice] payments over $1M of all medical specialties,” and have the “highest indemnity payment rates.” The study also found that “74% of physicians in Obstetrics and Gynecology were projected to face a [malpractice] claim by the age of 45 years.” The projected proportion of physicians facing a malpractice claim by the age of 65 years was higher still – “99% in high risk specialties” such as OB/GYN. “Physicians consistently report concern over malpractice and the intense pressure to practice defensive medicine,” as well as “the indirect costs of litigation, such as time, stress, added work, and reputational damage.” Banning video cameras can mean the difference between getting sued or not; winning or losing; and a painful payout or an award that is catastrophic. As far back as winter of 1995, The Journal of Healthcare Risk Management was warning that videotapes “can easily become a part of the discovery process in a malpractice suit.” In March 1998, The Journal of Family Practice reported that “a liability insurer is now attempting to limit video cameras in labor and delivery suites ….” When a pregnancy termination is videotaped, it is not likely to be a miscarriage. All of which brings us back to the political angst stirred by Carly Fiorina’s debate reference to our abortion video and Planned Parenthood’s organ harvesting program. These politics help explain why our video and Fiorina’s statement have been desperately attacked with loud — and very weak — claims, as we have shown. Two Planned Parenthood abortionists named Nucatola and Dermish are on video describing an abortion procedure modified for brain harvesting. Its effect, if not its objective, is that the baby is kept alive longer because its skull is not crushed by a degree of cervical dilation which would be adequate for pregnancy termination but inadequate to protect fetal brain tissue. But Ms. Fiorina also said during the CNN debate that aborting babies and plundering their organs while their hearts are still beating “is about the character of our nation.”One is reminded of the “Falun Gong prisoners who are being kept alive [in China] only until it’s time to harvest their organs — or … the tens of thousands of Uighurs who have to endure the same fate.” (National Review, August 24, 2015, “China’s Fatal Attraction.”). Ethan Gutmann, in his book The Slaughter: Mass Killings, Organ Harvesting, and Chinas’ Secret Solution to Its Dissident Problem, says “about 65,000 practitioners of the Falun Gong religion … were killed for their organs between 2000 and 2008.” He adds that “as many as half a million to a million Falun Gong adherents are believed to be in China’s Laogai Prison system at any given time,” and that “Israel is the only country so far to forbid its citizens from receiving organ transplants in China due to alleged … harvesting.” (Freebeacon.com, “Organ Harvesting New Form of Execution in China,” August 13, 2014). Israel’s sensitivity on this issue should come as no surprise. National Socialist doctors tortured to death enormous numbers of Jewish Holocaust victims subjected to horrific research experiments. Dr. Joseph Mengele was obsessed with killing Jewish children, particularly twins. He would harvest “specimens [which] were preserved and shipped out to the Institute in Berlin-Dahlem for further research” (JewishVirtualLibrary.org, “Nazi Medical Experiments: Background & Overview”). These death camp atrocities bear a chilling resemblance to StemExpress CEO Cate Dyer’s video admission that she ships the heads, etc. of late-term aborted babies to research labs. She repeats the oft-expressed preference for intact delivery abortions “which we’ve done a lot …” and explains that she sometimes ships the baby “back to our lab in its entirety.” Of baby’s heads, she says that many researchers “open the box [and] go ‘Oh God!’ so yeah, so many of the academic labs cannot fly like that. They’re not capable.” She laughs that these “lab techs freak out and have meltdowns ….” (LiveActionNews.org, “StemExpress CEO Jokes About Shipping …,” August 21, 2015). The National Socialists killed over one million Jewish children during the Holocaust (U.S. Holocaust Memorial Museum, ushmm.org), so it is ironic that Israel “permits abortions at any stage of pregnancy” (Tabletmag.com, “On Israel’s Liberal Abortion Policies,” June 16, 2015). That puts Israel’s abortion rate (25%) on a par with China’s (26%). It means that 2 million Jewish children have been aborted since Israel’s founding in 1948. That is twice as many as were killed by Hitler (Aleteia.org, “Are American Tax Payers Underwriting Israeli Abortions?” January 15, 2014). What meaningful moral distinction can be drawn between an Israeli doctor killing a Jewish baby a few days before full term and a death camp doctor killing a Jewish baby a few days after delivery? Neither the LA Times nor many other mainstream news organizations gave comparable coverage to former StemExpress “procurement technician” Holly O’Donnell’s sickening description of cutting out the brain of a baby whose heart was still beating. In fact, The Guardian article quoted above explicitly states the paper’s refusal to include a link to the CBR abortion video to which Carly Fiorina made reference in her CNN debate. Their cover-up may not matter much, however, because 155,000 people had already viewed the video in the first few days following that debate. Many societies are increasingly polarized between privileged predators and impoverished prey. Ethicists have become malleable “yes” men, paid to seldom say “no.” What self-serving depravity can no longer be rationalized? Thank God that one principled candidate in the crowded field of presidential contenders had the counter-cultural courage to stand up and shout, “Stop!” Carly Fiorina is right in all the ways which matter most. Click here to read this article on Breitbart.com. Click here to view the CBR video on YouTube.